These highlights do not include all the information needed to use ASCOR® safely and effectively. See full prescribing information for ASCOR. ASCOR (asorbic acid injection), for intravenous use. ​Oxalate nephropathy and Nephrolithiasis:​ Ascorbic acid has been associated with development of acute or chronic oxalate nephropathy following prolonged use of high doses of ascorbic acid infusion. Patients with renal disease including renal impairment, history of oxalate kidney stones, geriatric patients, and pediatric patients less than 2 years old may be at increased risk (5.1). ​Hemolysis:​ Patients with glucose-6-phosphate dehydrogenase deficiency are at risk of severe hemolysis; a reduced is recommended (5.2). ​Laboratory Test Interference:​ Ascorbic acid may interfere with laboratory tests based on oxidation-reduction reactions, including blood and urine glucose testing (5.3). ​To report SUSPECTED ADVERSE REACTIONS, contact McGuff Pharmaceuticals, Inc., toll free at 1-800-603-4795 or FDA at 1-800-FDA-1088 or ​www.fda.gov/medwatch. ​Antibiotics:​ Ascorbic acid may decrease the activities of erythromycin, kanamycin, streptomycin, doxycycline, and lincomycin. 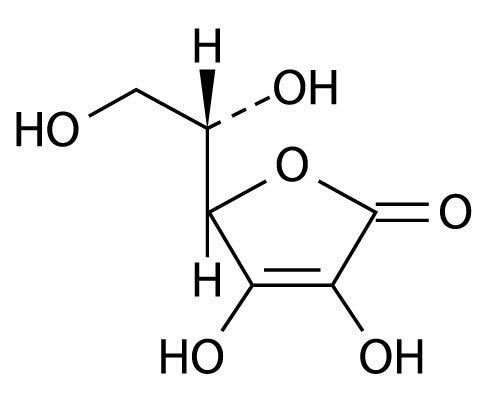 Bleomycin is inactivated ​in vitro ​by ascorbic acid (7.1). ​Amphetamine and Other Drugs Affected by Urine Acidification:​ Ascorbic acid may cause acidification of the urine and result in decreased amphetamine serum levels affect excretion and plasma concentrations of other drugs sensitive to urine pH (7.2). ASCOR ® is indicated for the short term (up to 1 week) treatment of scurvy in adult and pediatric patients, age 5 months and older, for whom oral administration is not possible, insufficient or contraindicated. ASCOR vials contain 25, 000 mg of ascorbic acid and the largest recommended single dose is 200 mg. Do not give the entire contents of the vial to a single patient. Do not administer ASCOR as an undiluted intravenous sensitive. b. Penetrate each PBP vial closure only one time with a suitable sterile transfer device or dispensing set that allows measured dispensing of the contents. Given that pressure may develop within the vial during storage, excercise caution when withdrawing contents from the vial. c. Once the closure system has been penetrated, complete all dispensing from the PBP vial within 4 hours. Each dose must be used immediately. Discard unused portion. e. Prepare the recommended dose based on the patient population [ see Dosage and Administration (2.2), (2.3)]. f. Visually inspect for particulate matter and discoloration prior to administration (the diluted ASCOR solution should appear colorless to pale yellow). Women who are pregnant or lactating and patients with glucose-6-dehydrogenase deficiency should not exceed the U.S. Recommended Dietary Allowance (RDA) or daily Adequate Intake (AI) level for ascorbic acid for their age group and condition [ ​ see Warnings and Precautions (5.2) and Use in Specific Populations (8.1, 8.2)]. Acute and chronic oxalate nephropathy have been reported with prolonged administration of high doses of ascorbic acid. Acidification of the urine by ascorbic acid may cause precipitation of cysteine, urate or oxalate stones. Patients with renal disease including renal impairment, history of oxalate kidney stones, and geriatric patients may be at increased risk for oxalate nephropathy while receiving treatment with ascorbic acid. Pediatric patients less than 2 years of age may be at increased risk for oxalate nephropathy during treatment with ascorbic acid because their kidneys are immature [see Use in Specific Populations ( 8.4, 8.5, 8.6)]. Monitor renal function in patients at increased risk receiving ASCOR. Discontinue ASCOR in patients who develop oxalate nephropathy and treat any suspected oxalate nephropathy. ASCOR is not indicated for prolonged administration (the maximum recommended duration is one week) [see Dosage and Administration ( 2.1)] . Hemolysis has been reported with administration of ascorbic acid in patients with glucose-6-phosphate dehydrogenase deficiency. Patients with glucose-6-phosphate dehydrogenase may be at increased risk for severe hemolysis during treatment with ascorbic acid. Monitor hemoglobin and blood count and use a reduced dose of ASCOR in patients with glucose-6-phosphate dehydrogenase deficiency [see Dosage and Administration ( 2.3)] . Discontinue treatment with ASCOR if hemolysis is suspected and treat as needed. Ascorbic acid may interfere with laboratory tests based on oxidation-reduction reactions, including blood and urine glucose testing, nitrite and bilirubin levels, and leucocyte count testing. If possible, laboratory tests based on oxidation-reduction reactions should be delayed until 24 hours after infusion of ASCOR [see Drug Interactions ( 7.4)]. ASCOR should not be rapidly administered. Rapid intravenous administration (>250 mg/minute) of ASCOR may cause temporary faintness or nausea, lethargy, flushing, dizziness, and headache (the recommended infusion rates of diluted ASCOR solution are 1.3 mg/minute (Pediatric Patients age 5 months to less than 12 months), 3.3 mg/minute (Pediatric Patients age 1 year to less than 11 years) and 33 mg/minute (Adults and Pediatric Patients 11 years and older) [see Dosage and Administration (2.2)] ) . Acute and chronic oxalate nephropathy have occurred with prolonged administration of high doses of ascorbic acid [see Warnings and Precautions (5.1)] . In patients with glucose-6-phosphate dehydrogenase deficiency severe hemolysis has occurred [see Warnings and Precautions (5.2)] . In addition, acidification of urine by ascorbic acid will alter the excretion of certain drugs affected by the pH of the urine (e.g., fluphenazine) when administered concurrently. It has been reported that concurrent administration of ascorbic acid and fluphenazine has resulted in decreased fluphenazine plasma concentrations. Standard monitoring of therapy is warranted. Because ascorbic acid is a strong reducing agent, it can interfere with numerous laboratory tests based on oxidation-reduction reactions (e.g., glucose, nitrite and bilirubin levels, leukocyte count, etc.). Chemical detecting methods based on colorimetric reactions are generally those tests affected. Ascorbic acid may lead to inaccurate results (false negatives) obtained for checking blood or urinary glucose levels, nitrite, bilirubin, and leukocytes if tested during or within 24 hours after infusion [see Warnings and Precautions (5.3)] . Follow the U.S. Recommended Dietary Allowances (RDA) for pregnant women when considering use of ASCOR for treatment of scurvy [see Dosage and Administration (2.3)] . There are no available data on use of ASCOR or another ascorbic acid injection in pregnant women. However, a published meta–analysis of randomized studies evaluating a large number of pregnant women who took oral ascorbic acid (vitamin C) (through diet and supplementation) at doses ranging from 500 to1000 mg/day (2.5 to 5 times the recommended daily intravenous dose, respectively) [see Dosage and Administration (2.3)] between the 9th and 16th weeks of pregnancy showed no increased risk of adverse pregnancy outcomes such as miscarriage, preterm premature rupture of membranes, preterm delivery or pregnancy induced hypertension when compared to placebo. These data cannot definitely establish or exclude the absence of a risk with ascorbic acid (vitamin C) during pregnancy. There are no data on the presence of ascorbic acid (vitamin C) in human milk following intravenous dosing in lactating women. Ascorbic acid (vitamin C) is present in human milk after maternal oral intake. Maternal oral intake of ascorbic acid (vitamin C) exceeding the U.S. Recommended Dietary Allowances (RDA) for lactation does not influence the ascorbic acid (vitamin C) content in breast milk or the estimated daily amount received by breastfed infants. There are no data on the effect of ascorbic acid (vitamin C) on milk production or the breastfed infant. The developmental and health benefits of breastfeeding should be considered along with the mother’s clinical need for ASCOR and any potential adverse effects on the breastfed child from ASCOR or from the underlying maternal condition. Follow the U.S. Recommended Dietary Allowances (RDA) for lactating women when considering use of ASCOR for treatment of scurvy [see Dosage and Administration (2.3)]. ASCOR is indicated for the short term (up to 1 week) treatment of scurvy in pediatric patients age 5 months and older for whom oral administration is not possible, insufficient or contraindicated. The safety profile of ascorbic acid in pediatric patients is similar to adults; however, pediatric patients less than 2 years of age may be at higher risk of oxalate nephropathy following ascorbic acid administration due to age-related decreased glomerular filtration [see Warnings and Precautions (5.1)]. Glomerular filtration rate is known to decrease with age and as such may increase risk for oxalate nephropathy following ascorbic acid administration in elderly population [see Warnings and Precautions (5.1)] . ASCOR should be used with caution in scorbutic patients with a history of or risk of developing renal oxalate stones or evidence of renal impairment or other issues (e.g., patients on dialysis, patients with diabetic nephropathy, and renal transplant recipients). These patients may be at increased risk of developing acute or chronic oxalate nephropathy following high dose ascorbic acid administration [see Warning and Precaution (5.1)]. ASCOR (ascorbic acid injection) for intravenous use is a colorless to pale yellow, preservative-free, hypertonic, sterile, non-pyrogenic solution of ascorbic acid. ASCOR must be diluted with an appropriate infusion solution (e.g., 5% Dextrose Injection, USP, Sterile Water for Injection, USP) [see Dosage and Administration (2.1)] . In a single pharmacokinetic study, healthy male and female adults (n=8) were given a single intravenous dose of 1000 mg ascorbic acid (5 times the largest recommended single dose) infused over a 30 minute period. The mean peak exposure to ascorbic acid was 436.2 µM and occurred at the end of the 30 minute infusion. Protect from light. This product contains no preservative. See Dosage and Administration (2.1), for detailed instructions on preparation, dilution, and administration of ASCOR. Inform patients that treatment with ASCOR may increase their risk of oxalate nephropathy [see Warnings and Precautions (5.1)] . Inform patients that treatment with ASCOR may impact laboratory results, including blood and urine glucose tests, up to 24 hours after infusion [see Warnings and Precautions (5.3)]. Inform patients with glucose-6-phosphate dehydrogenase deficiency that treatment with ASCOR may increase their risk of hemolysis [see Warnings and Precautions (5.2)].